For more than 50 years, HEF has designed and developed high performance bushings, rings and joints for demanding applications in industries such as Construction, Mining, Steel Processing, Transportation, Forestry, Material Handling and Agriculture. HEF bushings are recognized worldwide for their excellent frictional and anti-seizure properties, and their ability to withstand high loads. HEF bushings are also industry’s choice for applications requiring extended intervals between lubrication. Cross-hatching involves a network of grooves on the inner surface of the bushing. For a lubricated joint, a grease reservoir is built-up in the interconnecting channels, allowing lubrication intervals to increase by as much as 100%. Debris present in the contact zone often exhibits very high hardness, leading to premature joint wear in many industrial situations. Cross-hatching allows effective evacuation of unwanted particles and debris. HEF offers several patented bushing designs, in a broad range of sizes, as well as carburized and ground sleeve bearings. To determine the best design for a particular application, designers should first consider the constraints of the work environment, including abrasion, loading, corrosion and maintenance requirements. When selecting the appropriate bushing for each application, the pressure-velocity (PV) factor is particularly important. For joints operating under dry or greased conditions, the thermal energy generated by friction is proportional to the pressure (P), the sliding velocity (V) and the friction coefficient (F) between the sliding surfaces. Given a pair of materials, there is a maximum PV beyond which surfaces can no longer absorb the generated friction, leading to seizure or melting of the surfaces. 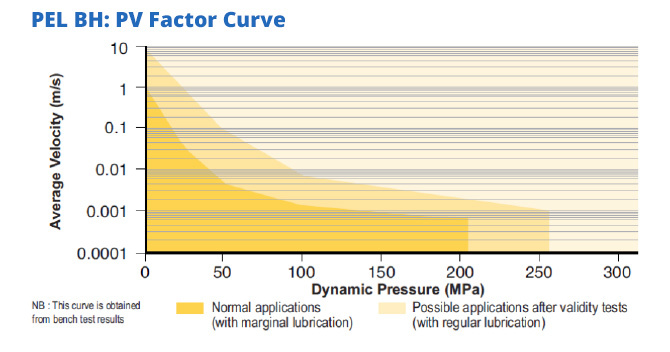 Each of the HEF bushing designs has its own PV curves (see example below), which are indispensable for determining the appropriate bushing for particular applications and operating conditions. In addition to bushings and bearings, HEF supplies a broad range of other friction components, including pins, shafts and sleeves; slides and pads, washers, rollers, screws and nuts.